If you’re like me, your life is totally together and scheduled and organized and you never feel stressed or overwhelmed by anything. Ok, so maybe that’s not exactly true -- but that’s where improving Executive Function skills can help. Executive Function skills are certainly not only about helping kids manage schoolwork. While adults tend to have better self-management skills than children, they have greater demands in their daily lives to meet as well. In fact, most adults feel that they barely have time to read a long intro to a blog post, so I’ll cut straight to the chase: Here are three common challenges that arise in adulthood and three ways that Executive Function skills can help you rise to those challenges. The problem: You call to schedule a (long overdue) dental appointment, only to find that the time you’ve scheduled is on the same evening of Emma’s soccer game, and your husband can’t take her because (you learn when you ask) he’s got a big meeting that will keep him at the office late that night. So you find yourself sheepishly calling the dentist’s office to say that, after further consideration, you’ve decided you don’t deserve clean teeth. It’s hard enough managing your own life, but the situation becomes infinitely more complicated when you have to juggle your own appointments around your spouse’s and your kids’. What you can do: Get your family used to using the same calendar system together. If you want to go low-tech, that can just be a calendar hung in a place in the home where everyone can see it and add appointments to it. But if you’re more tech-minded, try having everyone in the family set up their own Google Calendar, and then share that calendar with other members of the family. (You might have to do this for young kids, but once they’re old enough, it’s a great way to get them practicing planning and time management skills.) The benefit of Google Calendar (or other online calendar options) is that you can use a smartphone app to update the calendar as appointments are made. In other words, other members of the family can see those updates in real time. It might take some work to build the habit at first, but the reward is fewer missed appointments and fewer embarrassing cancellation calls. The problem: Managing to keep on top of dentist appointments is tough enough, but work comes with its own slew of executive function challenges. You know that you need to devote some serious time to preparing the presentation for Monday, but your inbox is inundated with emails, you’ve got a pile of papers on your desk to sort through, and your coworker Gary keeps calling you over to help him figure out what font he should use on a report. It can seem impossible to get through a day satisfied that you’ve accomplished all you need to. What you can do: Sometimes, the feeling of constant deluge at the office is largely the result of so many things clamoring for attention at once - in other words, it’s an issue that might be addressed with Executive Function strategies. A tool like Covey Quadrants is perfect for such situations, as it requires you to mindfully sort your tasks into four quadrants, based on whether or not they’re urgent or important. This can help you gain control amidst all the attentional noise, by helping you to sort out what’s urgent and important (the presentation) from what’s urgent but not important (answering those emails) from what’s neither urgent nor important (being Gary’s unpaid font consultant). Each day will always come with new unexpected demands on your attention, but the right tools can keep you more calm and strategic in dealing with them. “Right, I went to the gym this weekend and put my wallet in there,” he says when you produce it. As he thanks you and rushes to the door, forgetting his keys on the bathroom counter, you hear your kids shouting to ask if lunch is ready yet. While it might be easier to recognize when our kids need help with Executive Functioning, the truth is that adults are by no means paragons of self-management perfection. Research shows that Executive Function skills tend to peak between the ages of 20 and 29. But these skills need conscious and consistent work to be improved and maintained. While we might be a little (or a lot) better than our kids (or our spouse), and while our challenges might look different, if we’re honest with ourselves we’ll often find places where an Executive Functioning boost could be tremendously helpful. The good news is: just as with physical fitness and excercise, working on these skills can make for a happier, healthier life — one with less forgetful partners, better managed work stress, and regularly cleaned teeth. 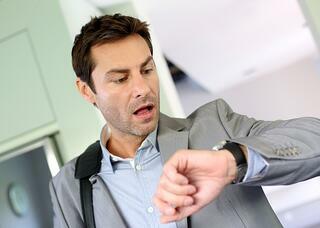 Do you - or someone you care about - appear forgetful, distracted, or unmotivated? 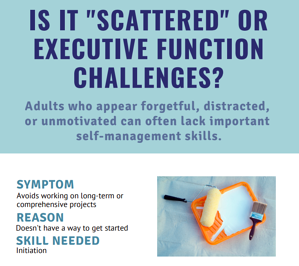 Download our infographic describing 5 symptoms of Executive Function challenges in adults.